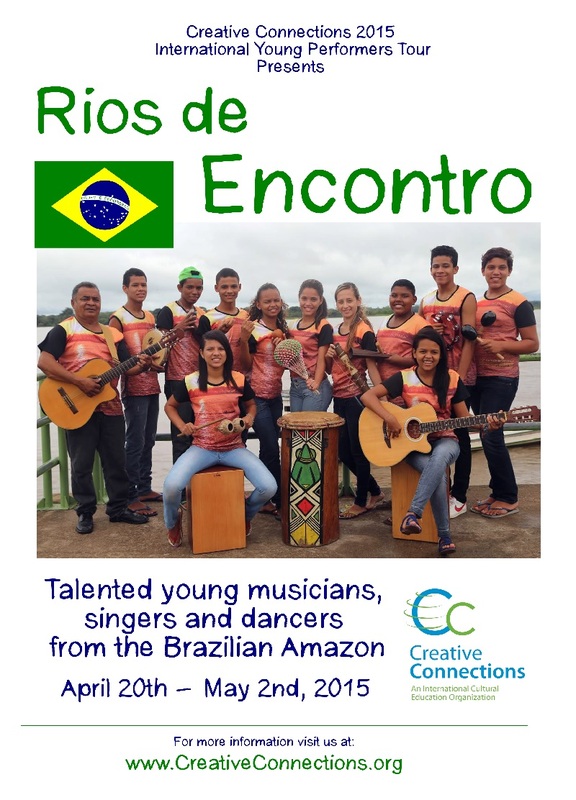 Coming April 20-May 1, 2015 The celebrated Rios de Encontro (Rivers of Meeting) brings its singers, dancers, musicians and arts educators from the Cabelo Seco community in the Brazilian Amazon to provide a unique performance of its African, indigenous and riverside heritage. 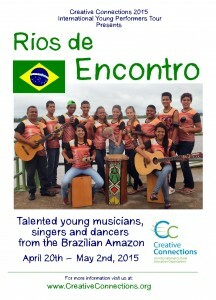 ‘Rios’ is a national and UNESCO award winner for arts-led innovation in schools. The Performance In dazzling costume, through powerful dance, exceptional percussion and expressive mime, the eight youth performers tell the compelling story of a girl who is mysteriously tempted to abandon her grandmother and their simple fishing village to experience the fast-paced hip-hop life style of the city. Not only is her own fate in the balance, but the very health of the dying River Tocantins. Will it ever rise and flow again? Throughout their 50-minute performance, Rios de Encontro invites young audience members to learn the rhythms, choruses and choreography of this Afro-Indigenous reinterpretation of an Amazonian legend, enabling them to experience the cultural beauty and contemporary challenges of the Amazon. Cultural Workshops Following the performance, workshop participants will have the opportunity to dialogue, dance, sing, and play with the young Brazilian artists. Students of all ages will gain an unforgettable impression of how these young people have changed their lives through the beauty and arts of the Amazon and, in so doing, are shaping a future that affects us all.